On Sunday night, Callaghan commented that it’d been a while since I’d posted a garage gym workout. I checked my planner (in which I track pretty much everything I do). Indeed, it’d been two months since I last documented a garage gym workout. 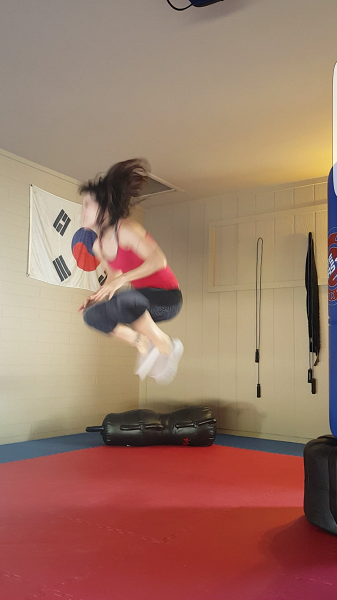 I did this plyometrics-based martial arts workout in my garage yesterday morning, before it got hot. 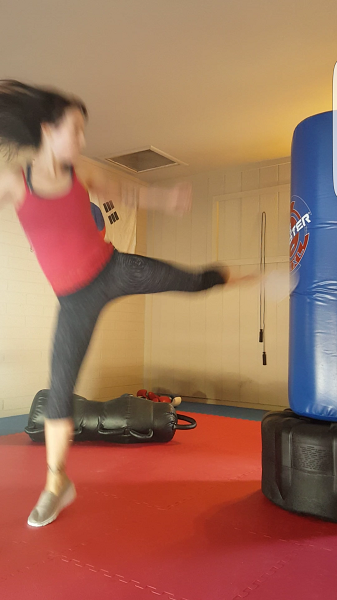 I did it early, so of course, 10 hours later, the after-effects were setting in; I opted to let my body rest instead of putting it through my normal Monday night kickboxing class at the gym. Not great planning on my part, but I had no regrets! This morning, I’m mostly feeling the workout in my core, especially in my obliques (side torso part of the core). I feel my legs secondarily. This makes sense, considering my current level of fitness and the techniques I practiced. And it’s good. Something better be sore after a 1.5 hour workout! As per usual, I didn’t record all the segments of the workout. My warm-up included jump-roping, alternating between regular skips and double-time high knees. I also did some dynamic stretches across the floor (walking knee raises and front stretch kicks). 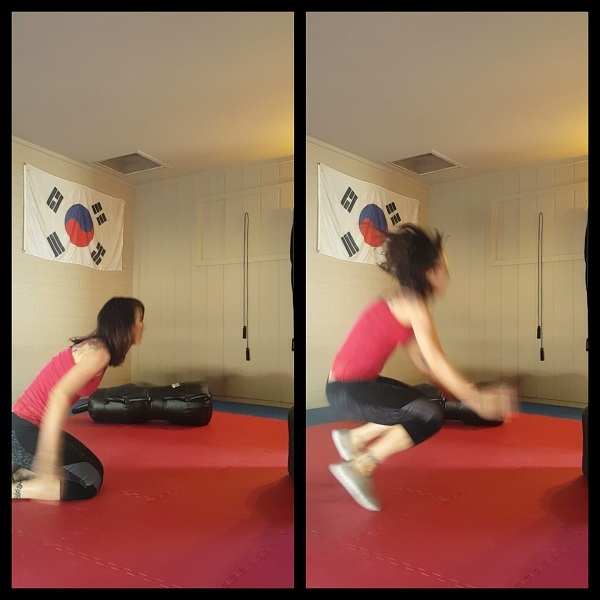 For the main workout, I stuck with basic techniques… nothing fancy (i.e. no spinning moves). I’ll say it again: I value these recordings because they show me where my form is off. In this workout, I found more need for improvement than usual. 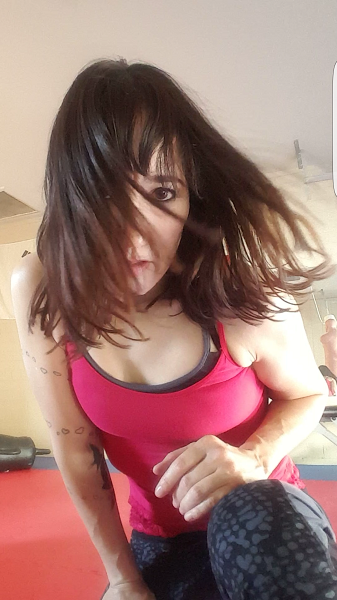 For what it’s worth, though, I’m here with the customary pics for those of you who enjoy these peeks into our home workouts! The pics come with my usual disclaimer: I’m not a trainer, and I don’t post the pics with the idea that they demonstrate perfection. They most certainly do not. Callaghan’s been working out in the garage, too, by the way. Maybe one day he’ll let me post pics of his workouts! 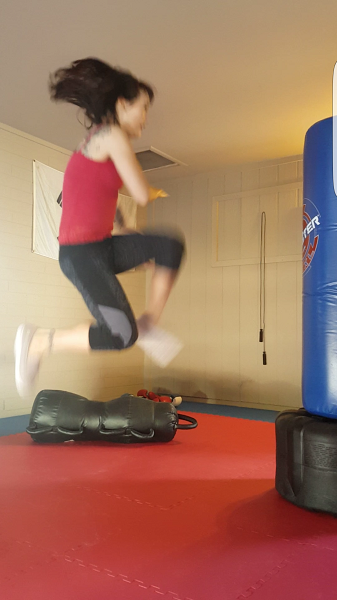 Since the theme of this workout was plyometrics, aka jumping, I went through some moves like this one. Jump tucks are done from a stationary position. You squat and jump straight up while tucking your knees and feet up to your body at the top of the jump. 2). I have no idea what this move is called. It’s a good core/plyo exercise where you sit back on your knees and then spring up to your feet without using your hands for support. This is not easy, and I definitely need to keep at them. I had nothing to actually strike here, so I practiced the technique on an imaginary target. 4). Flying punch (“superman punch”). 5). 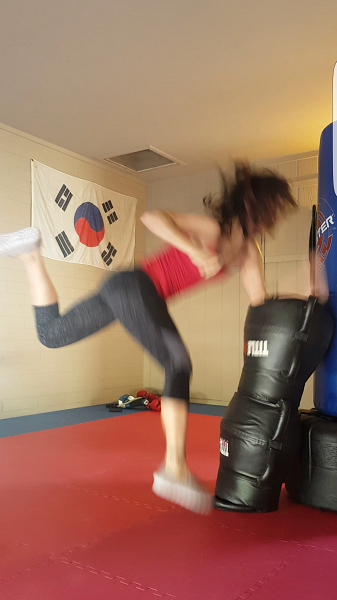 Flying down elbow strike. In case it’s hard to see: it’s my left elbow striking the dummy. My right arm is chambered back for a follow-up, but I’m not sure that this is practical in terms of preparing for a counter-strike. It’s probably not. This is something to keep in mind for next time. 6). 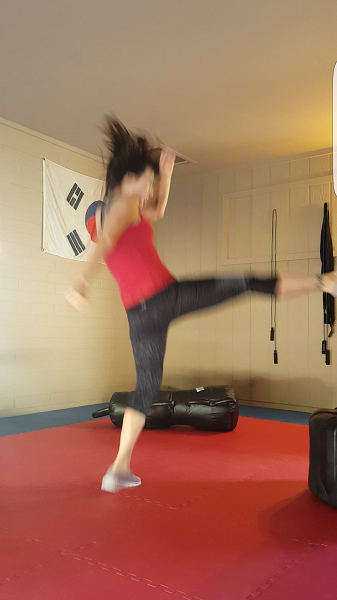 Jumping front snap kick. With this kick and the next, the biggest problem I see is… everything! No, really, I’d have to say that I need to work on gauging my distance, first and foremost. 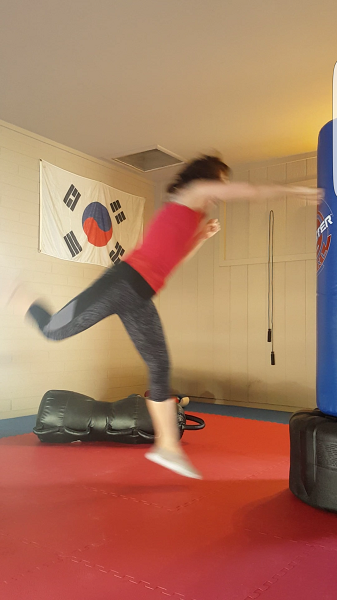 Since I needed the bag to be in the camera frame, I had limited space for running to gain momentum, a fact that in itself provides a valuable training opportunity: in a real-life situation, you can’t control the parameters of your environment. Granted, in real life, I wouldn’t execute this move with limited space. That being said, being able to adjust and control distance is yet a skill I’m working to hone. Now in this pic, my problem with distance is very clear! A few times in this series of posts, I also posted what I ate following the workouts, and of course there were the silly “walking back” pics. I’m leaving it at this for now. And that was that! The workout didn’t seem as long as it was… I wasn’t overly affected by the increasing heat of the morning. I kept well-hydrated throughout (always important to do, regardless), and I had the garage door and the back door open for whatever cross-breeze could be had. We’re still researching A/C options for the garage!